암호화폐(가상화폐) 메디블록(MEDX, ERC20)이 코인수퍼(Coinsuper) 거래소에 상장 된다. 9일(한국시간) 코인마켓캘린더(Coinmarketcal.com)에 따르면 메디블록은 9일(현지시간) 코인수퍼에서 거래가 시작되는 것으로 전해졌다. 메디블록은 블록 체인 기술로 구축 된 환자, 의료 서비스 제공자 및 데이터 연구원을 위한 분산된 의료 정보 생태계를 의미한다. 한편 메디블록은 이날 코인마켓캡에서 전일 대비 1.96% 떨어진 0.0070달러에 거래되고 있다. 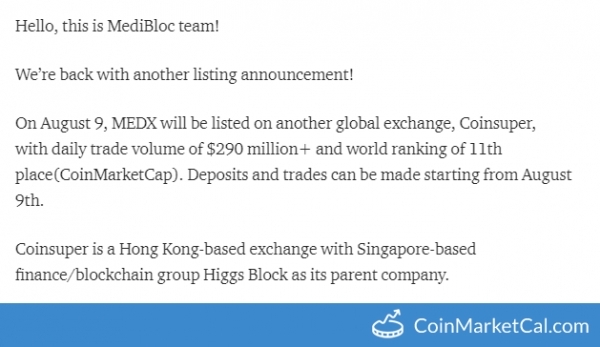 Medibloc(MEDX, ERC20) will be listed on Coinsuper Exchange. According to the Coin Market Calendar(coinmarketcal.com) on the 9th(Korea time), MEDX reported to start trading at Coinsuper on the 9th(local time). MEDX is traded at 0.0070 dollars, down 1.96 percent on coinmarketcap from the previous day.